Baltimore-based food blogger Elena at Biscuits and Such is leaving my fair city and moving to her beloved North Carolina so I thought it was the perfect time to share one of her lovely pies. She organized B'eat More Pie Fest here in Baltimore so she knows her pie! 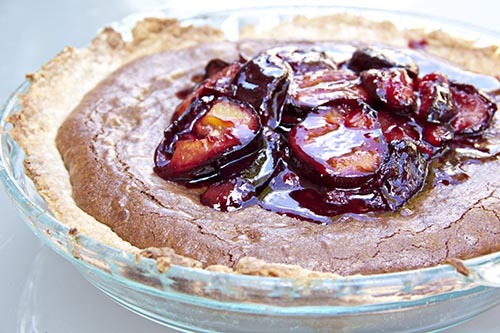 This is a version of chocolate chess pie that she takes to the next level by caramelizing Italian (I'm thinking prune) plums to top the pie. How beautiful those plums look! If you can't find plums, I think caramelizing some pears would work well. Check out the recipe at Biscuits and Such.